Wedding Cake Topper 9"H, Weight 1 lb-3oz, Resin and Stone mix, rhinestones, fabric tulle veil. Oval Base - 3.5" x 5"
'Cherish' Cake Topper is available to order now. Language of Love designed by Gina Freehill is a complete wedding & anniversary accessory line. It has a timeless charm that will enhance your special day and your cherished memories for years to come. 'Cherish' Wedding Cake Topper is Gina Freehill's first design that features the brides hair down, beautifully sculpted with a floral wreath & ribbon veil. The elegant fitted wedding gown captures a current but sophisticated style, accented with rhinestones and an engraved literary caption along the side "Let all you do be done in love." Corinthians 16:14. With the groom positioned behind the bride this piece showcases a modern look of beautiful brides today. 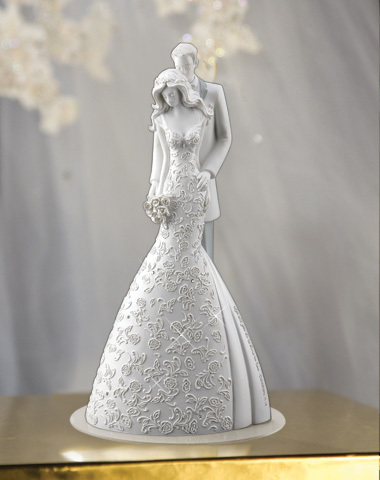 The Cherish cake topper is captivating and portrays the beauty of modern elegance. The Cherish Wedding Cake Topper is also a stand-alone collectible and as an added value to customers the collectible size 'Language of Love' Cake Toppers are hand signed by Gina Freehill.